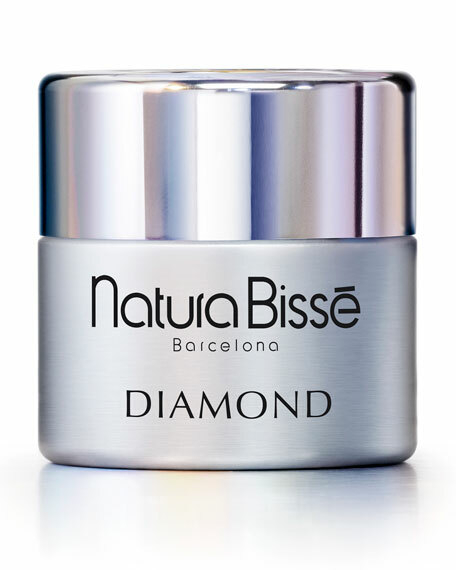 Get younger-looking skin with Natura Bisse's new antiaging Diamond creams, each specially formulated for all skin types displaying the first visible signs of aging. Available in three formulas: one for dry skin, one for oily skin, and one specially for the eye area.  Regenerates and reenergizes the skin.  Reaches deeply into the skin's core components to counteract the natural aging process with advanced antiaging ingredients.  Attacks frown lines and increases elasticity and firmness.  Restores softness and suppleness.  Powerful age-fighting ingredients include grapeseed extract, beta-glucans (derived from dried yeast extract), a multi-vitamin complex that includes vitamins C and E, pure ursolic acid, hydrolyzed soy proteins, and an oligo-collagen complex. Both come in 1.7-ounce jars.  Increases firmness and elasticity with a bio-relief complex that includes water lily and green tea extracts.  Stimulates cell's energy metabolism to prevent and repair wrinkles with artemia salina extract.  Enhances skin regeneration with high concentrations of essential elements, including pure ursolic acid, an oligo-collagen complex, rose hip oil, and wheat germ oil.  Reinforces the skin's natural defense system and promotes free radical protection with botanical extracts.  Also helps to diminish dark circles and puffiness. Innovation, efficiency and sophisticated elegance are the trademarks of Natura Bissé, renowned Spanish family owned company founded in 1979. Universally recognized for ground-breaking technology in results driven skincare and world class spa treatments, Natura Bissé embodies the artisan craft of true luxury. Exquisite textures, advanced formulations and award-winning research create the perfect combination for healthy, beautiful skin at every age and for every skin concern. The new luxury is measured by the appearance of your skin.